Free download HttpMaster Latest Version. When working with HttpMaster, you will most of the time manage HttpMaster project properties and properties of the request items contained inside the project. Project properties offer global options to customize internet requests that will be executed; changes to this properties affect all project request items.HttpMaster project can be saved to disk as a file with ‘hmpr’ extension; you can also save existing opened project to a new file (Save As).Saved HttpMaster projects can be opened with an open dialog or from the list of recently opened projects. You can also double-click ‘hmpr’ file in Windows Explorer to open it automatically in HttpMaster. You can specify which http headers to include with the generated requests. You can pick from the list of standard http headers or enter your custom header name and specify its value. Headers specified inside the project will be included with each generated internet request unless project http headers are disabled in request item properties. In project properties you can also specify dynamic parameters of different data type and different generation type with optional format.Dynamic parameters enable you to include dynamic data with the request items; this can be useful to generate multiple requests based on the dynamic parameter data. For example, you can include dynamic parameter in the URL of the request item to produce dynamically generated internet requests. 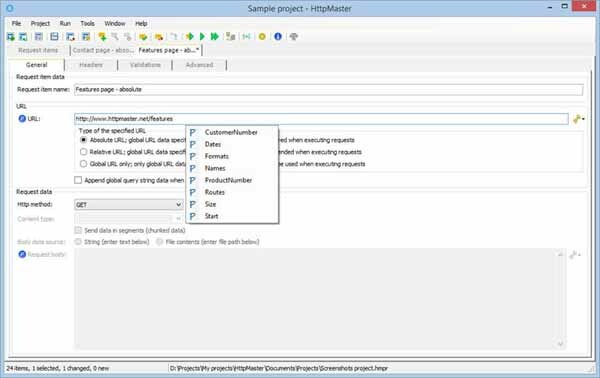 HttpMaster offers powerful execution capabilities and allows you to execute only opened request item, only selected request items, or all project request items. During the execution process you can monitor executions progress and status of each request item.HttpMaster also allows complete execution data to be saved to external file with ‘hmex’ extension. You can reopen this file anytime later to review execution data.